Valentine's Day inspired me to design this piece, and I'm pretty excited about it! I have to admit, I sometimes need a big fat reminder, to make time for my husband: he & I time. When we get home at night our life is hectic. We’ve got dinner, baths, homework, movie time, and then Luke goes to sleep and I work. We have the best intentions to have a date night, but we just don’t seem to get to it. To me, Valentine’s Day is a great opportunity to make each other a priority and reconnect. I feel like it’s very easy for me to forget, but in all truth, my husband and my marriage are my foundation. He's the stability to my erratic personality. He knows how to push my buttons because he knows me to the core. He's thoughtful, strong, and he works relentlessly to make sure my needs and our kids’ needs are met. A lot of my designs are inspired by my love of my kids, but they’re kind of hard to forget! They need me or something constantly. Luke isn’t the type that puts his needs first so, in all honesty, I often forget to put him first. I wanted to design something that honored us and I could wear, hopefully to put our marriage in the front of my mind much more often. Our love has grown and changed in a beautiful way since we were first married, and I’m very proud of it. It's not without its fights, or normal everyday bumps, but I couldn’t be any happier. 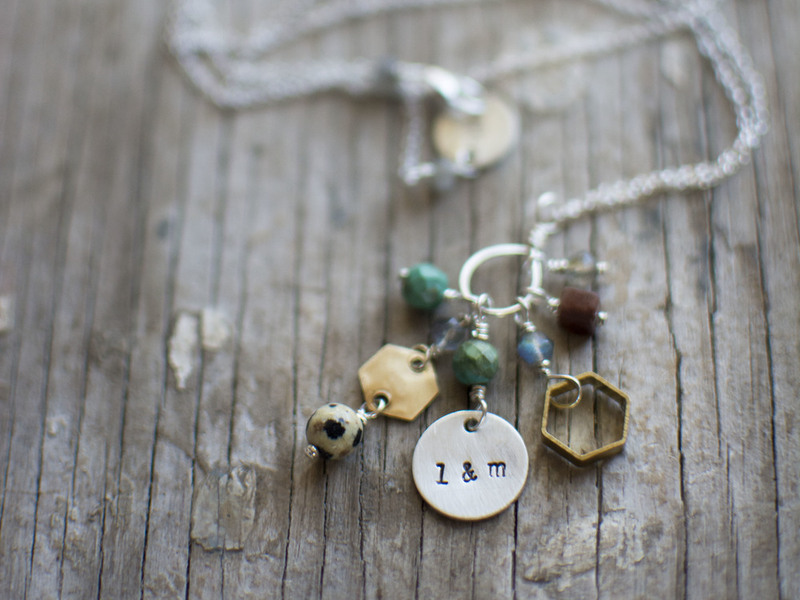 This necklace embodies love, commitment, & connection. The quirks & the little imperfections become what’s most beautiful about it. The sterling silver disc anchors the piece. It’s hammered with Luke & my initials. I stamp letters into sterling silver, because they become permanent. They’re set. The hammered piece represents the very thing I hope for my marriage, something lasting. It also represents the fact that I want a marriage worth wishing that permanence, so I have to do the work. I love silver because it’s wearable, and it ages beautifully. I think that’s one of the most heartfelt things to wish in a relationship. That it can grow and change with you. I chose to add stones instead of merely having just a simple disc. I really wanted to make something more adorned, because I really want to honor our marriage. Me being the simple person I am, I don’t take adornment too far. So I’ve embellished the pieces enough so it feels special to me, but not overdone. I chose stones that complement each other and have just the right amount of imperfection. I love semi-precious stones because they’re authentic, beautiful, and full of visual interest. It’s the flaws that make them and people interesting and beautiful. You’re lucky to have the quirks, that’s where the stories come from! Labradorite and Turquoise are my favorites. Brass hexagons too, and of course my current stone crush, Dalmatian Jasper. They all have something interesting about them. They bring out the best in each other. In my 9 years of being married, I’ve learned just how well Luke & I suit each other. I always thought it was important to have someone who thought just like you, but what really works for us is our balance. We are each other’s counterpart. The reason we work is part of the reason the stones work so well together. I’m committing to wear this piece and to add a little spark to our relationship at the same time. I will wear my piece each day to remind me to text a hello, or make Luke’s favorite dinner. I designed the piece to look great with a pair jeans and a t-shirt or a little black dress. This piece is meant to be worn every day. I kept mine long, so that I have to take it on and off. For one, I will forget it and its sentiment if I have it on all of the time. Two, I love long necklaces. Then last, I love something that’s special to me, and beautiful and the same time, but that’s not obvious what it’s about. Like my marriage, this piece is quietly meaningful. My husband and I don’t have to declare our love from the mountaintops. I know what this piece represents, but most people will just see me wearing a necklace that’s pretty. Have I scared you with the window into my crazy mind? When my design was all said and done, I think the necklace ended up being a perfect metaphor for our marriage. I named it the Valentine Necklace. I hope you like it! Thank you for reading! Have a great day!